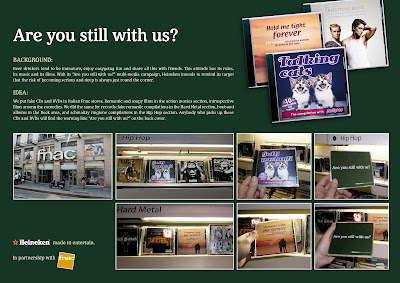 directdaily: Heineken "Are you still with us?" Beer drinkers tend to be immature, enjoy easygoing fun and share all this with their friends. This attitude has its rules, its music and its films. With its "Are you still with us?" multi-media campaign, Heineken intends to remind its target that the risk of becoming serious and deep is always just around the corner. They put fake CDs and DVDs in Italian Fnac stores. Romantic and soapy films in the action section, introspective films among the comedies. They did the same for records: fake romantic compilations in the Rock and Heavy Metal area and schmaltzy ringtone complications in the Hip Hop section. 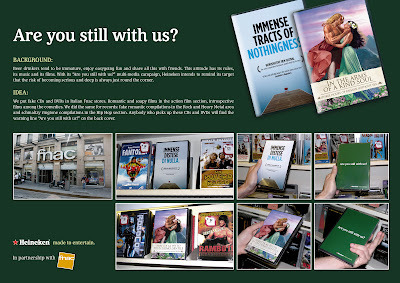 Anybody who picks up these CDs and DVDs will find the warning line "Are you still with us?" on the back cover. Ken Starck Painting Company "Caution!" Random House New Zealand "Man Trap"
Amnesty International Portugal "Report it"
Fisch Franke "The Living Poster"
Unicef / Tap Project "Dirty water"
Nike Livestrong "It's about you"
D-Reizen travel agency "Goldfish Hotel"
Walther Sporting firearms "Target calendar"
Misereor. Ihr Hilfswerk "The Donations Poster"
Standard Bank "Home improvement envelope"